The only thing that makes waiting for the subway less aggravating is spotting one of these colorful mosaics lining the platform. They’re mini history lessons depicting some hallmark of the area from when the station was built, say a noteworthy building, like City Hall. 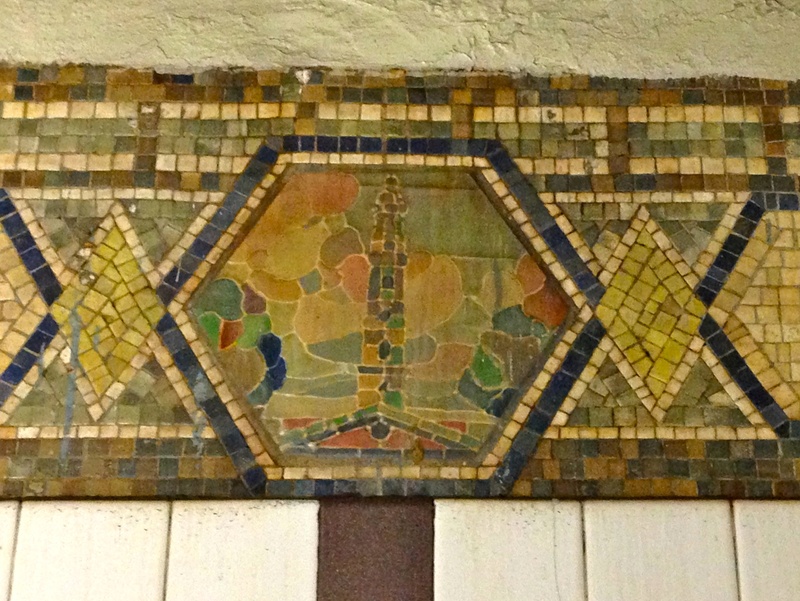 But the Canal Street 1 train platform, with mosaics of a chapel and spire, poses a mystery. 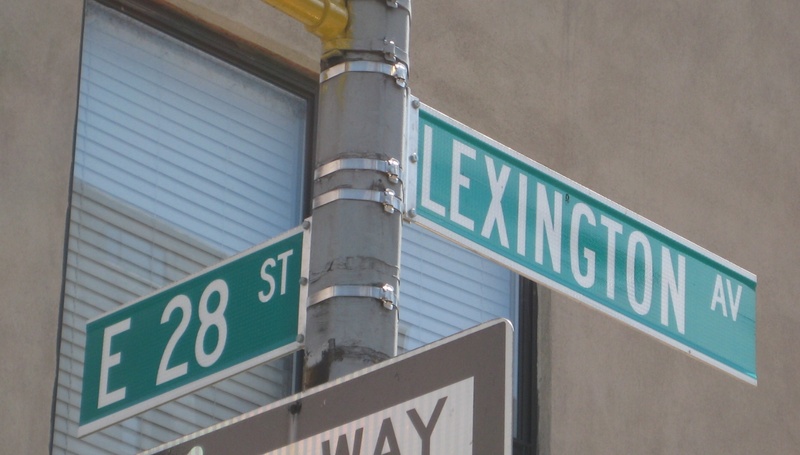 In the vicinity of the Varick Street station, no church exists. It did at one time—and it was a beauty. The lovely St. John’s Chapel was built in 1807 (predating the street grid!) 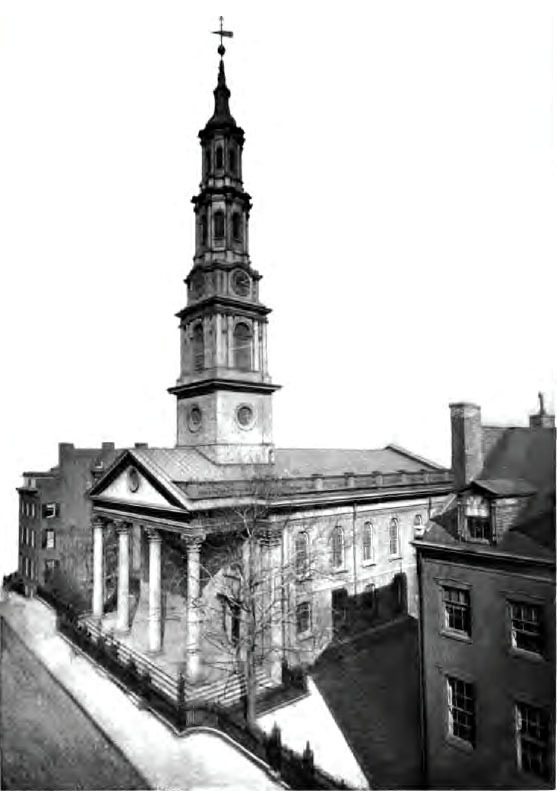 as a parish of Trinity Church, and it became the centerpiece of a luxurious residential enclave called St. John’s Park. 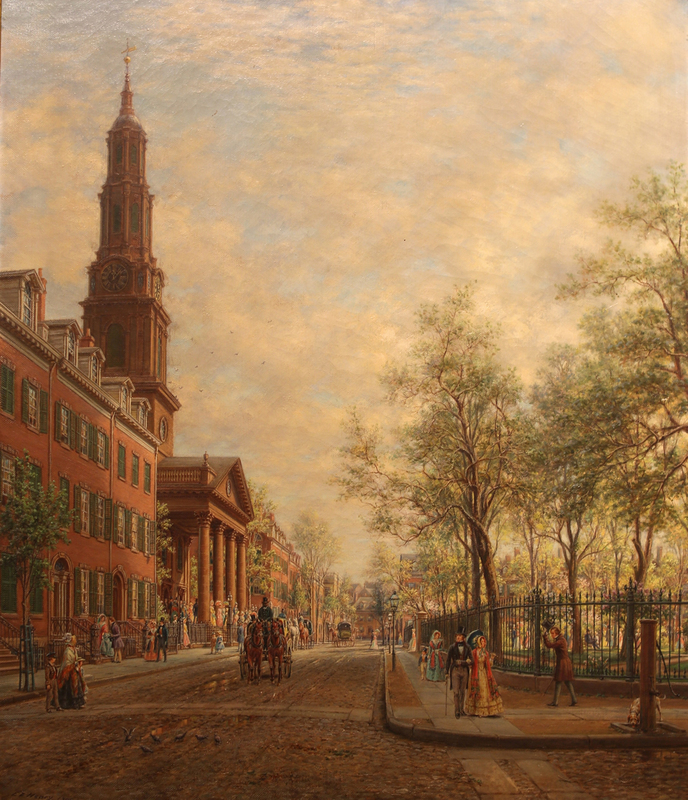 Well-to-do families built Georgian row houses around a small genteel park, and the neighborhood remained fashionable through the 1840s (below, in a 1905 painting by Edward Lamson Henry). St. John’s Park began losing its appeal in the 1850s, when wealthy New Yorkers chose to relocate uptown. Then a railway terminal replaced the park in 1868, turning the enclave into one of factories and tenements. Lovely St. John’s Chapel, with its sandstone portico and columns and 200-foot oak spire and clock dominating the skyline for over 100 years, was torn down in 1918. All that remains today is the subway mosaic, a small patch of green at the Holland Tunnel entrance—and a forgotten lane in Tribeca bearing the St. John’s name. 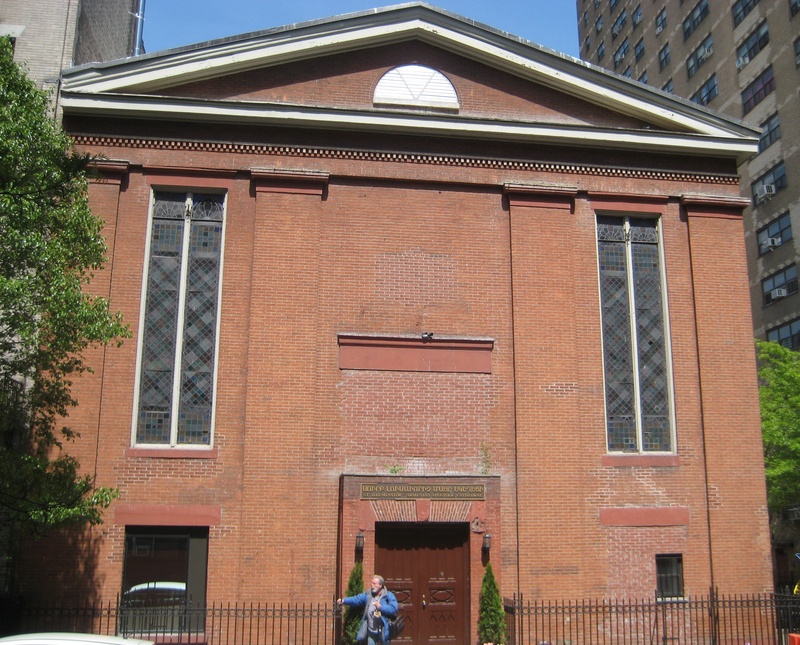 The cathedral is still there, on East 27th Street between Second and Third Avenues. But few other traces of the old neighborhood remain. There’s Kalustyan’s grocery-turned-spice shop on 28th Street, a juncture now known as Curry Hill thanks to all the Indian restaurants and food stores there. Huge, gold-domed St. Vartan Cathedral still draws a crowd at Second Avenue and 34th Street, and a park up the block on 35th Street bears the name of St. Vartan, the fifth century Armenian Christian martyr.